I can’t believe it’s already been nine years since Conflux came out. It was a very exciting time in my personal Magic career: I found Alara to be a bright and fascinating setting, and interesting as a different style of multicolor block from the recent Ravnica sets. For all that Dominaria was about a celebration of Magic’s history, we still fall too often into the trap of referring to past sets as “gone” or “lost”. Never forget that a card once printed exists until it’s physically destroyed, and that there’s no reason you shouldn’t play with whatever you want, from whatever set you want, in whatever way you want. Reliquary Tower has the same game text as Spellbook, from Exodus, but has an advantage in that it doesn’t take a space that would be used by a different spell. Most “normal” decks find it hard to reach a point where their strategy requires them to have more than seven cards in hand at all times, although there are exceptions: consider, for example, the classic Swans of Bryn Argoll / Seismic Assault decks. It’s not generally worth throwing into any given deck, but in the decks where its clause is likely to be relevant, the fact that it produces mana and doesn’t get in the way of the rest of the gameplan is very valuable. 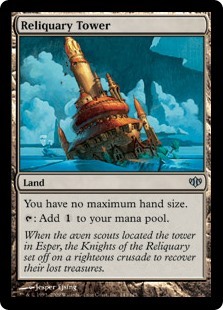 A Casual all-star since Conflux, Reliquary Tower splices together the “Spellbook” effect and a colorless-producing land into one sleek, easy-to-appreciate package. Not every deck will have need of this particular effect, but it can put in a lot of work in decks that aim to draw a lot of cards and have a lot of answers at the ready.